As beneficial as it may be, many people nowadays aren’t able to join a gym simply because they lack time, money, or both. Luckily, there are lots of ways to get fit without having a gym membership, and I believe that resistance band workouts are one of the best alternatives. Today, I’m going to talk about resistance bands - who they are for, how can one exercise with them, and so on. Also, I’ll review the top 4 products from this category, so if this is something that interests you, read on. For those who’ve never heard of resistance bands, let me explain what they are. Resistance bands are an exercise tool made of robust and durable rubber, which come in different shapes, lengths and tensions. Some of them are a closed loop while others have open ends with or without handles. They were first mainly utilized in rehabilitation training but have recently been catching traction with the fitness community as a light, inexpensive, and useful piece of equipment. As I’ve mentioned, the bands have varying tensions, so everyone can choose the one that’s suitable for their level of fitness. They can make exercises easier for beginners and harder for experienced athletes, so they are a very versatile tool. Flat resistance bands come in two forms: closed loop and open-ended. Each of these can be used for particular types of exercises, and some exercises can be done by either of them. All types of bands, including this one, are usually color-coded according to their thickness and tension level. Fit loop bands are also known as “mini bands” due to their small size. They most often serve as a mobility tool for shoulders and ankles, but can also be used for some leg exercises. Fit loops are compact and can be carried around easily anywhere you go. Unlike the previous two, this type of resistance bands is not flat, but it has a tubular form. These are made from sturdy latex rubber and have strong plastic handles attached to each end. Handle tube bands are great for strength training as they provide a lot of resistance and are available in many different tension levels. 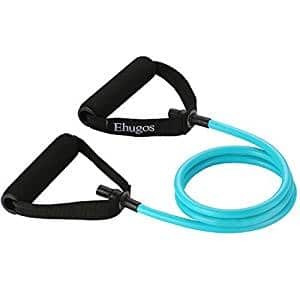 Clip resistance bands are basically the same product as the previous one, except that they do not have fixed handles on their ends but metal clips. This makes them more versatile because to those clips you can attach various extensions including handles, ankle cuffs and more. The clips can be used to hook the band to a secure spot (e.g., a pull-up bar, a door) and are more convenient to transport. Figure-8 bands are mini loop bands with two handles and tube in the middle which brings the opposite sides together forming number eight shape. These bands are good for exercises that require short and limited motions and are also pretty handy for shoulder mobility exercises. Among so many other fitness tools available, why should you buy resistance bands? You can find out here. Resistance bands are incredibly cost-effective, and some of them are cheaper than $10. Even band workout DVDs are more affordable than those for other kinds of workouts. Just imagine - the money that you’d normally pay for only one month of a gym membership can be used to buy a set of bands that’ll easily last you more than a year. No matter whether you are a beginner or a pro, you can benefit from rubber band exercises. All you need to do is find the resistance that’s good for you and start pumping. Also, beginners can use bands to make exercises like pull-ups less challenging, while experts can do the opposite and intensify their workouts. With the right set of resistance bands and sufficient knowledge, you can exercise pretty much anywhere. Going to the gym doesn’t have to be a necessity anymore as you’ll be able to do everything at home, or if the weather is nice, in the park. Resistance bands are so small that they can be stored even in the tiniest of homes. Place them in a drawer, under the bed, or in your closet and just whip them out when you wish to work out. Fitness freaks who like to get some exercise in even on vacations or business trips can easily pack up a few bands, bring them along, and get sweaty in the hotel. Rubber band training doesn’t require you to learn a whole new set of exercises - quite the contrary - use them for all the exercises that you already know. So for example, instead of using dumbbells, do curls with a band. Other movements that you can use the bands for are old favorites push-ups, squats, lunges, pull-ups, and so on. Our muscles quickly get used to the routines that we often perform, so it’s a good idea to switch it up from time to time. Those who lift a lot of weights can try to take a break from them and do the same exercises with bands instead. Despite doing the exact same movements, the bands will challenge your muscles in a new way. Perhaps the most crucial point of this list is that bands can give you a simple and effective workout. This means that you will be able to get stronger, more flexible, and more mobile by using this tool correctly. How to buy resistance bands? In case you don’t know which one is optimal for you, I’d suggest buying at least three different tension levels. Also, different muscle groups require different amounts of resistance so that you can use the stronger bands for large and the weaker bands for small muscle groups. Even though all band types are multifunctional, there are better and worse choices depending on your exercise routine. Do you want to do more strength work or do you need the bands for mobility exercises, or maybe yoga? Think about this question and then find what’s best for you. Some bands have handles, and some don’t. Others have clips to which one can attach rings, handles, or ankle cuffs. If you feel that you’d find some of these things useful, get the band that has them. This is a short and effective full-body workout for the ladies. It can be done by anyone regardless of how fit or unfit they are. Perform 8-12 reps for 3 sets. Use bands with tension suitable for each exercise. Step on the band with your feet around shoulder width apart. Grab the ends of the band, pull them up to just above the shoulders, and keep them here. Squat down and get back up. Sit down on the floor and extend the legs in front of you. Place the band over your feet, grab the ends, and with your torso upright, pull the bands towards your stomach. Keep your arms in a 90-degree angle. Kneel down on a mat, throw the band over your upper back, take an end by each hand, and press them down on the floor. Contract your abs, straighten the arms, go down and push back up. Sit down on the floor with your legs slightly bent in the knees. Lean back to around 45 degrees, grab the band, extend your arms forward, and pull the band apart to the with of your shoulders. Twist the arms and the torso to one side and then to the other. Here is a set of basic strength exercises ideal for guys. If the reps are too many for you, feel free to do less. Throw the band over your upper back and press the ends into the floor with your hands. Get into the top position for the push-up, go down and push back up. Anchor the middle part of the band to a bar or a doorknob, grab each end and pull back with your lower arms parallel to the floor. Place the band over the back of your neck, stand on each end with your feet, and grab the band somewhere around your waist. Pull your hips back and lower your torso until it’s almost parallel to the floor. Go back up leading with your chest. Double wrap the band around your ankles, lay on your side, lift up to a side plank on your elbow, and push one leg up and down for reps. Switch sides. Reehut offers you an array of single bands with handles, each of a different resistance level. The tensions go from 2-4lbs to 70-75lbs, so everyone can find one that’s right for them at the moment. The bands are made from eco-friendly natural latex, and the handles are foam covered and comfortable. In the package, you’ll also get a door anchor, a carrying case, as well as a starter guide. These bands are very simple and straightforward flat loops ideal for any kind of workout. They are especially good for yoga as they’re relatively large and allow you a lot of freedom of movement. The bands are made from thick, durable rubber, and they come in five different tension levels. You can use them at home, the gym, or anywhere you wish to workout, as they are compact and easy to bring along. Those who wish to buy more bands at once should take a look at the Black Mountain Set. In it, you’ll find five clip bands of different tensions. Also, a soft ankle strap and a door anchor are included in the set. All the bands are 48 inches long, and if you wish, you can stack them up to get more resistance. If you’re a beginner, you will like the fact that you get a starter guide and an exercise chart in the package too. ​Last but not least, the Dynapro set includes four mini resistance bands with tensions ranging from light to heavy. These are perfect for ladies who wish to tone up their lower body, but can also be used for upper body exercises. They’re made of eco-friendly rubber and are rather thin. The manufacturer offers a one-year money-back guarantee for those who aren’t satisfied. As you can see, many different products fall into the category of resistance bands, so it’s important to know your needs before you go out to buy one. However, most bands are very versatile, so it’s not so easy to make a big mistake. Nevertheless, I’ve chosen what I think is the best product of today’s round-up, and it is the Black Mountain set. The reasons for my decision are simple - you get 5 high-quality bands for a low price along with accessories and instructions. What more could you ask for? If this one doesn’t cut it for you, feel free to check out the other three. Until next time - stay strong! Previous Post Best Compression Tights and Leggings – For Running and Working Out Next Post What are the Best Deadlift Shoes for Powerlifting and Bodybuilding?